Cyclesnack: Back on the 'Horse! The new wheelset rocks and the bike is working great! 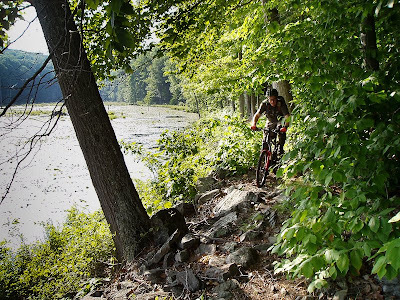 Put the bike through it's paces at Bennett's Pond on Tuesday. Here I am pictured above riding the Pond Trail, which is insanely technical and extremely challenging. Going back to gears and full suspension has been a bit of a relearning exercise but after a ride like that and no sore back what more can you ask for? Crazy Guy on a Bike ... this guy is really Crazy! New Wheels for the Horse!